A minute expansion of Kant and an agreement on hydropower cooperation were some of the outcomes of Putin’s visit to Kyrgyzstan. On Thursday, March 28 Russian President Vladimir Putin made a state visit to Kyrgyzstan. Before Putin landed in Bishkek, the Russian government announced a $30 million grant to help Kyrgyzstan balance its budget. The visit included the usual bevy of agreements — according to Kyrgyz Deputy Prime Minister Jenish Razakov, 65 bilateral agreements worth $12 billion were expected to be inked. Eurasianet reported 30 signed during the visit and another dozen between private sector entities in advance of the visit. And, of course, there was effusive talk of a strong bilateral relationship. 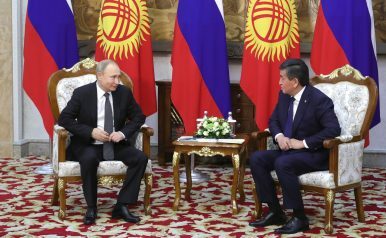 “I want to stress once again: the Kyrgyz Republic is Russia’s partner and reliable ally with which we are connected by time-tested and cherished ties of friendship and mutual understanding,” Putin said. Of note for the geopolitically minded is the apparent expansion of Russian military bases in Kyrgyzstan, by just under 60 hectares (less than a quarter of a square mile). According to Akipress, Kant’s area will increase by 40 hectares and a test base in Karakol on Issyk-Kul will grow by 18.3 hectares. As reported by RFE/RL, a protocol posted on Russia’s legal documents website also stated that the annual rent for Russia’s air base in Kant would increase from $4.5 million to $4.79 million. Of course, this depends on ratification of the agreement by both sides. RFE/RL also noted that rules concerning the use of drones on the base’s territory would be introduced. In 2001 the United States had established a presence at Manas International Airport. When the Russians moved into Kant two years later, Kyrgyzstan earned the strange position of the only country in the world hosting both Russian and American military installations. That lasted until the summer of 2014, when the United States vacated Manas. A complex array of factors contributed to the U.S. withdrawal from the base, including consistent Russian pressure on Kyrgyzstan, local Kyrgyz public discontent with the base, and then-U.S. President Barack Obama’s plans to drawdown U.S. forces in Afghanistan. It doesn’t seem that the topic of a second Russian base was brought up during Putin’s visit, though it very well may have been behind closed doors. “The agreement stipulates the participation of the Russian side in equipping the republic’s territory with new small hydropower plants and operating big hydropower plants,” the source reportedly said. A little more than three years ago, in late December 2015, then-Kyrgyz President Almazbek Atambayev grumbled loudly and publicly in his year-end address about uncompleted hydropower projects with Russian partners. “I don’t like uncompleted construction projects, one should be realistic. We all see the state of the Russian economy, it is, shall we say, not on the rise, and for objective reasons, these agreements [on the construction of hydropower plants] can’t be implemented by the Russian party,” he said at the time. Other Kyrgyz officials echoed that sentiment into early 2016 and Kyrgyzstan moved to nix its agreement with RusHydro in order to court other partners. But that proved difficult. Kyrgyz efforts to attract other investors went haywire when an unknown Czech company won the contract and then things got weird. The original agreement with RusHydro had been settled in 2012, when Russia renewed its lease for Kant. It’s unclear exactly what the recently agreed $1.5 billion will be directed to. “New small hydropower plants and operating big hydropower plants” is a very broad ranged of possibilities. One last note: Apparently Kyrgyz police arrested a pair of protesters outside the Russian Embassy in Bishkek — it’s located in the heart of downtown, right next to a trendy coffeeshop. According to reports, husband and wife duo Nurlan Karymshakov and Gulzana Imayeva were arrested and charged with inciting inter-ethnic hatred. They’d been holding posters calling Putin a “killer” and “occupier” with pleas for the Russian military to leave Kyrgyzstan. Remember the Eurasian Economic Union?On Trip to Russia, Kyrgyz President Atambayev Sings Putin's PraisesTouring the Backyard: Putin Pays Central Asia a VisitCan Russia and Turkmenistan Save CASA-1000?Is 2016 Going to Be Pivotal for Central Asia’s Pipeline Powers?